PowerUp's line of ESC's provide solid motor control performance. The design incorporates an ARM 32 bit processor which results in a very smooth linear throttle response. Automated startup algorithms combined with adaptive motor timing help to prevent motor cogging and synchronization issues that sometimes exist between certain motor / ESC combinations. 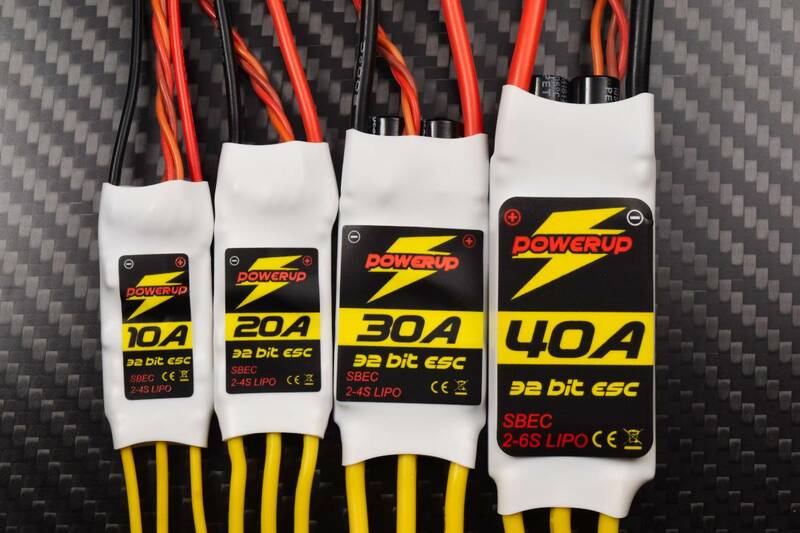 We are impressed with the build quality of these ESC's, the larger sizes have heat sinks, the SBEC's are 5 amps and up, and all the wiring is silicone sheathed, even the signal wiring. Pretty darn good at this price point! Need to change motor direction? No problem, motor direction can be reversed even in the field. It works like this, (The included instructions go into greater detail). During startup mode wait for the "long beep", then spin the propeller by hand in the desired direction of rotation and wait for an audio confirmation from the ESC. Once the confirmation has been given, give the propeller a second spin in the desired direction and presto chango, the ESC reverses direction! No more switching motor wires. Note: the ESC will remember the programmed motor direction indefinitely until you change it. This ESC does not come with battery or motor plugs. Links to those parts can be found at the bottom of this page. An ESC programming card is needed to adjust the advanced programmable options (listed below) of this ESC. A link to the card can be found at the bottom of this page. Regular signal throttle range is 900us-2400us.